Nintendo's highly anticipated Metroid Prime 2: Echoes takes the bounty hunter Samus Aran on a dark journey through dangerous parallel worlds. Most of the elements that made the first Prime so successful are back, but new gameplay elements keep things fresh. These include new weapons, enhanced moves and a deeper storyline. MP2 also lets players challenge four opponents in a split-screen death match mode. Retro Studios won praise for the first game, and their excellent design remains impressive with MP2's slick graphics, intuitive controls, and intelligently designed puzzles making an engrossing experience throughout. Metroid Prime 2 Echoes is an excellent sequel that exceeds expectations by delivering a more sophisticated and challenging experience. 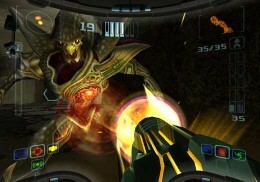 The first Metroid Prime title for the Gamecube won praise from gamers and critics alike for its intelligent update of the classic series. 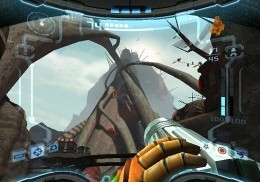 Developed by Retro Studios, the gameplay offered an intriguing mix of styles that blended traditional FPS action with interesting puzzle elements while creating an evocative series of alien landscapes to explore. Luckily, the new game doesn't stray too far from last installment which should please Metroid fans. As the game begins, our heroine Samus Aran is called to a mysterious planet named Aether where a group of Galactic soldiers have gone missing. After a strange anomaly splits time and space, Aether has been split by a cosmic anomaly into light and dark versions of itself. Two distinctly different alien races, the Luminoth and the Ing Horde populate each world. The Luminoth are the forces of light, while the evil Ing Horde have ravaged Light Aether. Unfortunately, the Luminoth are losing the battle and will be consumed by the evil forces unless someone stops it. It's up to Samus to defeat these foes by traveling between these parallel worlds. As she explores the twin worlds of Aether, the bounty hunter will also need to defeat the mysterious forces that are hunting her from the shadows. This play of light and dark sets up an intriguing plot that underlies the entire game, making Metroid Prime's storyline darker and more sophisticated than the previous game. 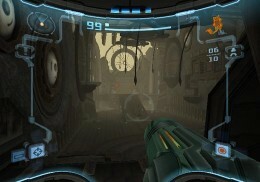 Metroid Prime 2's interface should be familiar to those who played the first game with the main controls remaining largely unchanged this time around. Most of the controls are configured in the same buttons, making it easy to jump right in. 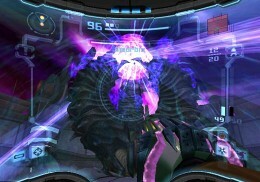 Most of the action takes place in the first-person perspective with the player viewing the action from inside Samus' visor. The suit itself allows the player to see their full status at any point in the game with their health, weapons and other items easily accessible. This approach also ties in nicely with the game's scanning element, where the player has to scan objects to gain information or activate them. Players can also use this during battles with boss characters to find their weak points, which isn't always as easy as it sounds. Maneuvering Samus around is likewise simple and intuitive, allowing players to strafe, jump or move through the environments with ease. The suit also offers quite an impressive array of weapons. Players can use their standard gun either in short bursts or can hold down on the fire button to charge their weapon for a devastating energy blast. These basic weapons will get you through the early levels, but you'll need more powerful weapons as you progress deeper into the game, such as Missile Launchers and grenades. However, the twist this time around is the fact that certain weapons will work in the light areas, but won't do much in dark areas and vice versa. This definitely adds to the challenge and requires you to adjust your inventory when you transport between worlds. Players can also upgrade Samus' suit in a number of ways so they can carry additional weapons, enlarge their ammo holding and more. Samus' other trademark ability is her morph ball, which allows here to roll up into a small size and traverse small tunnels in the game, and explore areas which she wouldn't ordinarily be able to reach. Rolling her around is surprisingly easy, and also has the added benefit of allowing players to see the levels from a third-person perspective. Samus' morph ball plays a surprisingly key role on many of the puzzles and seems to have been intergrated more extensively into the gameplay better this time around. You'll also find additional weapons, such as the Grapple Beam, which allows you to jump through chasms and gaps, in each level. From a gameplay standpoint, Metroid Prime 2 remains a top-notch title that challenges both the player's reflexes and their intellects. The gameplay stays true to the first title, with each level unfolding at an excellent pace. Each room has doors, some of which can be opened easily, while others require you to blast them open with a strong light or dark beam. While the level layouts are relatively straightforward, others are more complex and require you to solve puzzles or find hidden switches in order to progress. Luckily, you can use your onscreen map to find clues and directions. In addition, scanning objects can also reveal information you'll need later in the game or can be used to add to your Lore information, depending on what you scan. For example, dead alien creatures won't reveal that much, but the fallen soldiers' log entries can contain plenty of useful information. Scanning is also useful because this technique activates switches and objects that unlock doors. You can also use the scanner to find weak points or hidden switches in walls and doors. Samus' scanning function is definitely a unique aspect of Metroid Prime 2 that sets it apart from other titles on the market. While most FPS titles are linear, Metroid Prime 2 breaks the mold with a structure that requires you to remember where you've been instead of firing and forgetting. There are some areas that are basically inaccessible early on in the game that open up when you transport to the Dark Aether world. While the solving the puzzles and killing the Ing creatures is hard enough, there's a lot more to the game than meets the eye. Unlocking the game's many areas and secrets will require you to travel between both Light and Dark Aether. Samus can switch between these worlds using special teleportation areas. This might seem like an easy way of expanding the size of the game world, but the parallel levels are different enough that most players shouldn't mind too much. 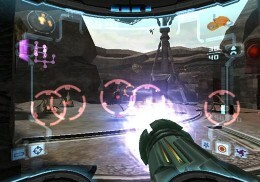 Metroid Prime 2's pacing is excellent in the way it gradually opens up, allowing players to explore each level thoroughly while gradually ramping up the difficulty. The puzzle elements are excellent, but Samus will also have to spend time fighting the enemy creatures. Her combat moves are straightforward, allowing you to aim and shoot at enemies easily. Samus can lock on these targets and strafe while firing to increase her shot accuracy while using the strafe to lessen her vulnerability. She can also hold the gun manually to look around manually that allows her to shoot at high altitude objects. These combat techniques come is particularly useful when you're fighting boss creatures and need to scan them while fighting them at the same time. While the many smaller Ing creatures are relatively simple to kill. These foes usually attack in waves making and are obviously more dangerous in groups. The boss battles, on the other hand, can become ridiculously intense, requiring a great deal of skill and luck to complete. However, it pays to scan all the bosses, and some will need to be scanned multiple times during the battles. For the most part, the gameplay unfolds at a good pace, and the enemies you face increase in difficulty at the same pace you gain upgrades and power-ups. Metroid Prime 2's balance is excellent, it should challenge veteran gamers at the later levels, but those new to the series should be able to enjoy themselves as well. The single player experience shines with tightly designed gameplay, but the sleek production values really showcase the underutilized Gamecube graphics abilities. Exploring the vast worlds shows an impressive variety in locations, with the visuals creating an expansive sense of scale in some areas, while other sections feel tighter and verge on claustrophobic. The level of detail in each environment is also impressive with many small details, such as computer terminals, alien statues and, other items rendered expertly. The overall design of these alien worlds is also impressive, with the web-strewn levels filled with alien pods and skeletons, giving Metroid Prime 2 an appropriately dark vibe. This is especially true when you're exploring the dark surroundings of Dark Aether. While the environments are impressive, the enemy design is also cool, with the insectoid Ings swarming around the player and attacking in beautiful, yet terrifying patterns. The animation and detail of the enemies is quite remarkable and they look fantastic in their game worlds. From a technical standpoint, Metroid Prime 2 performs solidly and runs at a smooth, consistent frame rate throughout. Most of the game unfolds without music, but the dramatic score rises in the background during intense battles and alerts players to dangerous areas ahead. Overall, Metroid Prime 2's production values are superb with an excellent graphics engine, detailed environments, and brilliant design that make it one of the most impressive looking Gamecube titles to date. Despite its solid production values and addictive gameplay, a few minor problems keep Metroid Prime 2 from achieving the perfection it aspires to. While the idea of Light and Dark Parallel worlds works for the most part, players will still find themselves spending a lot of time backtracking, which can be annoying. The other major problem comes in the game's placement of save points, they are set too far apart in some areas and further increases the amount of backtracking you'll do. While the addition of a multiplayer split screen mode is impressive, we found the small screens difficult to see, making it hard to follow the action. While these problems are significant, they aren't enough to seriously detract from the overall experience. Fans of the original Metroid Prime will find much to enjoy in this solid sequel. The gameplay mechanics and controls are excellent, making for an intuitive experience, while the new weapons and abilities keep things fresh. The game's intricate level design, vexing puzzles and structure means that players will be challenged throughout. Its unique scanning technique definitely sets it apart from other FPS titles, giving it a unique feel you won't find anywhere else. The enemies themselves pose quite a challenge, and the boss confrontations are as intense and difficult as anything in the first game. Additionally, the new light and dark mechanic makes an interesting addition to the series adding challenge and depth to the experience. They silenced the doubters last time around, and Retro Studios has once again done the Metroid name proud. This highly polished sequel offers an exceptional balance between puzzle and shooting elements that should keep players enthralled for many hours. Its exceptional depth, challenge, and balance makes Metroid Prime 2: Echoes one of the most satisfying and entertaining Gamecube titles to date.